Forged into the very essence of Henge’s design is the mantra of material first. 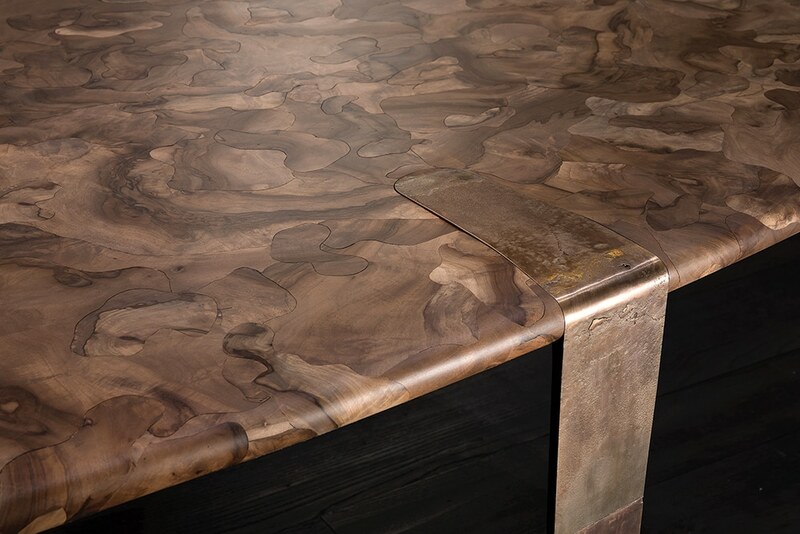 For thousands of years craftsmen have chosen natural materials that exhibit qualities to suit their needs. Henge is taking this foundation and flipping it on its head. Painstakingly searching out, analysing and listening to materials, absorbing their message and allowing their unique attributes to compose the design. The results are truly beautiful. A timeless range of furniture and interior pieces that exhibit qualities that are both ultra-modern and yet ancient. 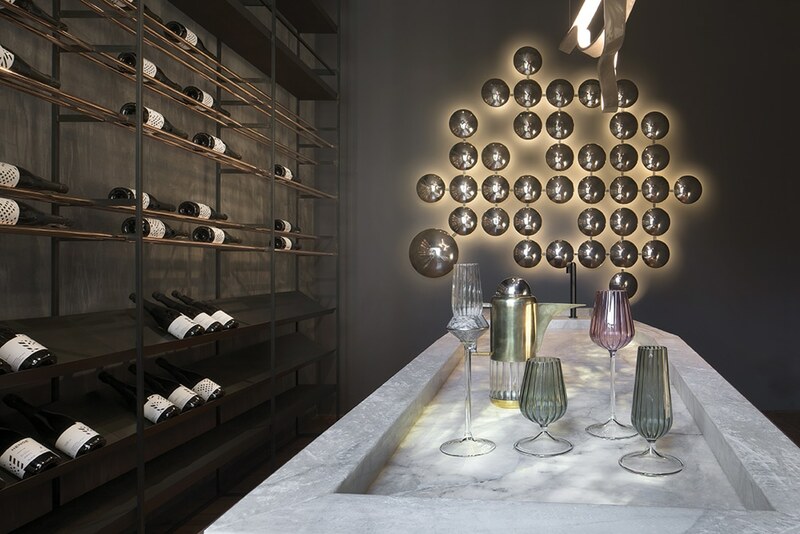 It is this elemental theme that permeates the 2018 collection; strong prehistoric stone in geometric shapes, cast metal fittings and veneers of fossilised swamp wood combined with modern LED lighting, casting just the right amount of light to illuminate the idiosyncrasies that so captivate the imagination of Castagna. Henge began in 2007 with a humble team of two designers and a craftsman, and their journey has seen them grow and accelerate onto the world stage. Unafraid of the seemingly impossible, the heart of the firm is the laboratory, a fitting name for the facility where design problems are overcome using creativity, ingenuity and patience. Solutions that require technological advances and traditional methodology in equal measure. The values that underpin their success, ‘their journey’, have remained steadfast. Henge combines these elements into pieces that are totally sympathetic to their origins, which Castagna believes is due to the wealth of experience that the Italian artisans have accrued over the centuries. While adopting technologically advanced techniques, no part of production has become mainstream, real hands bring individuality and character to every piece and that, as far as Castagna is concerned, will never change. Innovation & tradition; craftsmanship & technology: are these values not contradictory? It’s important to know where we’ve come from, what steps we’ve taken and why we’ve come here. I live and work in Italy, where there’s an immense wealth of unique experience and craftsmanship. Amongst these are many specialities that we risk losing because of the difficulty of remaining competitive in a global marketplace. For example; the furnaces of Murano glass – a world renowned craft, which has been gradually stifled by lack of creativity and low-cost production. Behind this wonderful world made of people and skilled hands lies the wealth of knowledge I call ‘Made in Italy’, the Italian know-how that is celebrated the world over. In this world, tradition and innovation, craftsmanship and technology are not antithetical, they are part of a single flow toward creativity. Experience and creativity converge, developing knowledge, enhancing what we do and expanding its potential using what the technological evolution makes available to us. Many of your designers, including yourself, are architects. Do you see a clear relationship between architecture and furniture design? 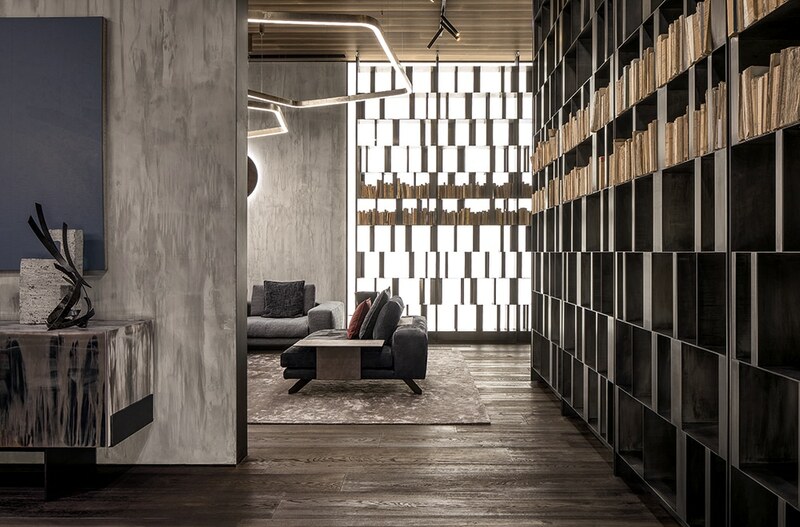 A firm rule doesn’t exist, but the affinity between the world of architecture and interior design is useful. 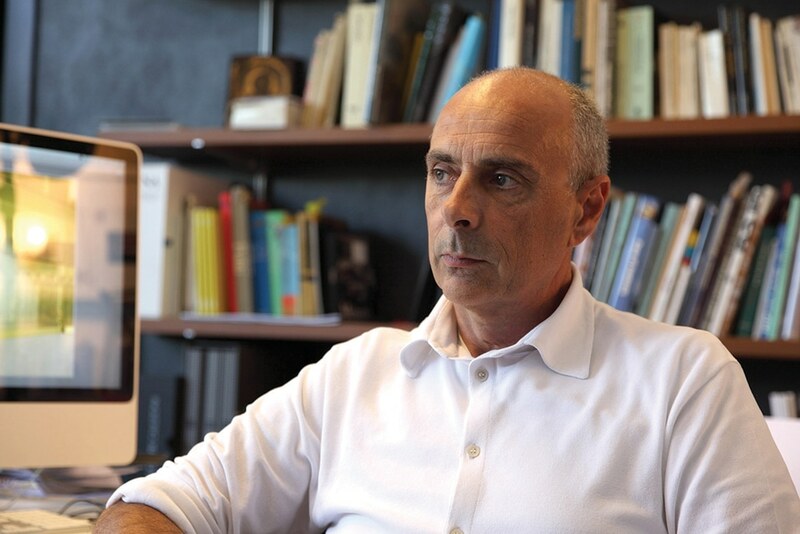 I attended the Polytechnic of Milan between the mid-’70s and ‘80s, and had the privilege of studying with Marco Zanuso and Achille Castiglioni. Back then there was no specialisation, it was believed that the architect’s approach was multidisciplinary, humanistic, independent of the scale of the project. An architectural project is not a layered cake but must follow a single vision based on a single idea for that particular client. Linking the various design aspects is the only way to understand the evolution of the form. Design is not an end in itself, it cannot be a stylistic exercise. I often design products based on the needs of my interior design, drawing on their themes and concepts. You use all the tones of the earth in a very elegant way. Is this a statement of your identity as a company or purely a reflection of the natural world? I use only natural materials in my designs: metal, stone, wood, glass, fabric and leather, working on their expressiveness, trying to emphasize their nature, their character and drawing on the poetry of their imperfections. This is a unique, distinctive characteristic of my personal design approach that I’ve followed for many years. All-natural materials have a strong personality, the incredible expressive power of nature must be supported, caressed and protected. Using these as a basis for contemporary pieces naturally results in timeless design. Above: The new Saetta table perfectly encapsulates the experimental work of Henge: Big Marinace stone top, a dramatic dark grey stone, and legs characterised by a bronze sand-casted finish. 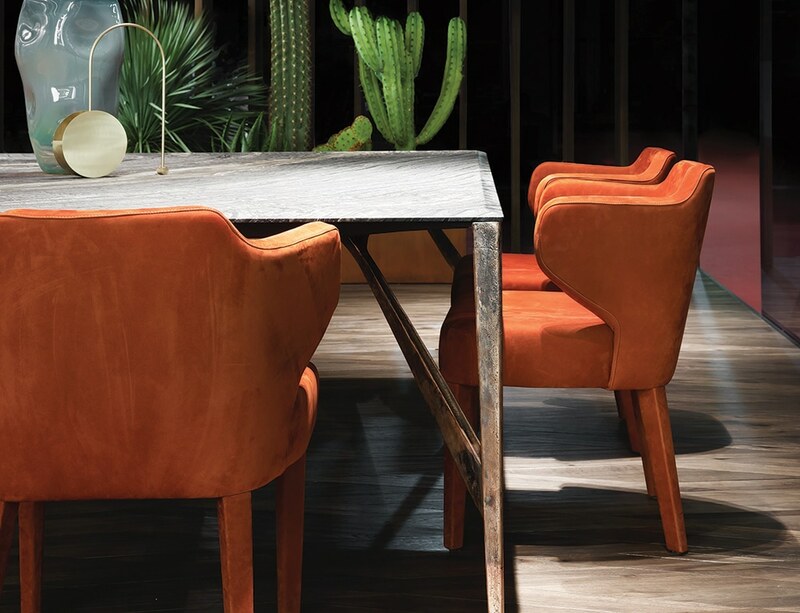 Next to the table, the new Ex-Tra Chair in red brick nubuck leather. Is it getting more and more difficult to source the rare raw materials you frequently use? Following my approach is complicated because it involves not only the artisanal production methods, but also the selection of particularly complex material. It’s impossible to order the raw material from a supplier. Stones must be selected block by block, slab by slab, often in quarries in the countries of origin. What is found in nature can be better than one could have imagined but it is hard to find it. Even with constant research and maintenance of raw material stocks it’s not always possible to guarantee the availability of materials, but this is the price to pay for working with such wonderful materials. It is this value, the charm and the difference compared with industrial production, which is fundamental to Henge’s philosophy. One of the products that impresses us most is the Oxymoron Table. Where did the idea for this creation come from? And how is it made? I was looking for a material that had the same expressiveness as the stones found in open scrubs for many years. I started from a small image found in a book. We then discovered that the material was not root but the part of the walnut plant that is between the root and trunk. This is worked with an ancient technique, unused for over 50 years. We only found one craftsman in all the Italian provinces who knew how to work that type of material. After cutting and composing the various pieces, cut from the trunk by hand, the wood was then heat treated to obtain the right colour without the addition of colours. The legs, created using bronze and brass sand casting, are made manually one by one and then adapted with CNC machines to be coupled with the top. Tradition and technology in perfect symbiosis, far removed from industrial production and production cycles. Above: The Oxymoron Table features a mesmerising micro-mosaic top formed from walnut wood fusion. 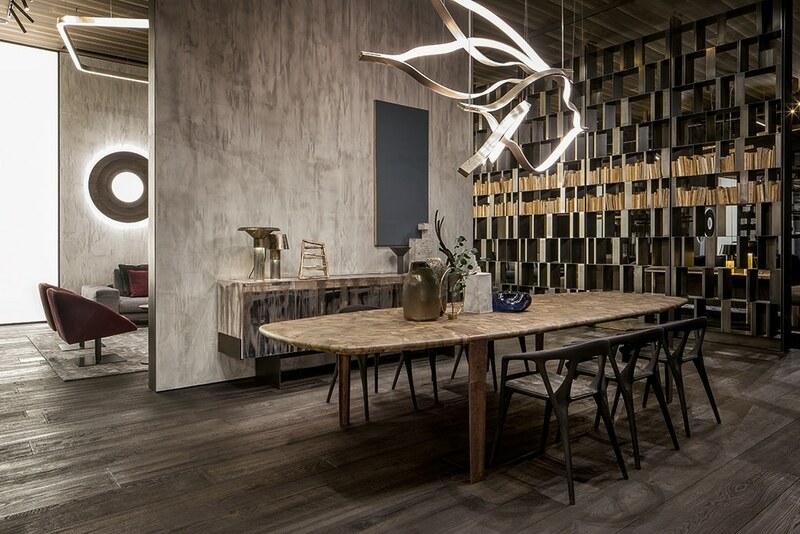 Above: The Oxymoron Table with walnut grey and leather Savanna chairs and the Tape light hanging above. 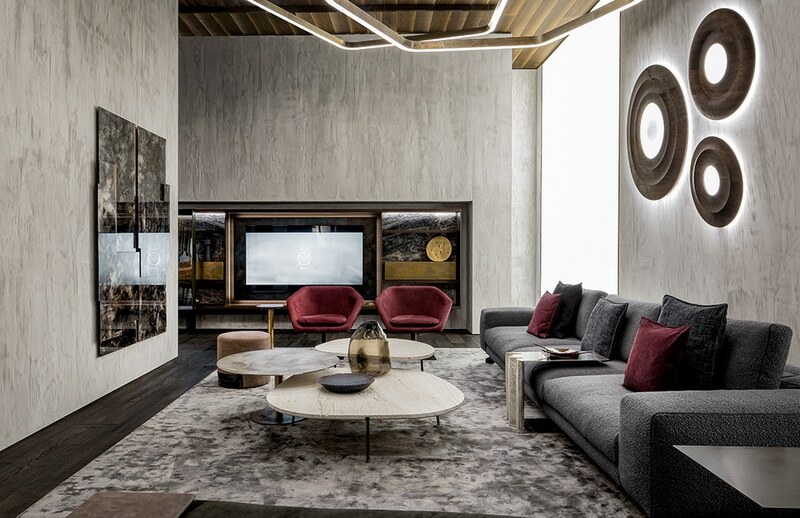 It didn’t take long for Henge to become one of the most iconic design companies in Italy. If you keep growing at the same rate will you be forced to industrialise your processes? Henge was born thinking about the furniture that we wanted to have in our home, a very different attitude from the market and distribution perspective. It’s a decidedly courageous and visionary approach that has no real comparison with any other brand. Henge started with very clear ideas and has remained consistent with those ideas. Soon after launching we found great, almost unexpected, success. The business rapidly consolidated, providing international distribution of furniture at the highest level. The recognition and respect of the brand obtained throughout the world in a few short years is a great satisfaction to me, showing that ideas and consistency can compete with size and power. Above: Behind the bar is the Cage Winery made with swamp oak shelves and polished copper finish with compartments for storing bottles of wine. H Silver Wall Clips illuminate the space. The production criterion is the consequence of this approach. At Henge the production line is formed by a network of artists, each of them a master of their profession, all linked to the company and trained in that type of production. Overall, this is what represents the real Made In Italy, a unique production approach, adopted by the company but handed down through many generations. As long as that unique Italian craftsmanship is recognized and appreciated around the world, Henge will have room for growth.